Phil Mickelson was well off the pace during the first round of the U.S. Open at Pebble Beach. (CNN) -- Englishman Paul Casey and American Shaun Micheel share the lead at the U.S. Open after both shot two-under rounds of 69 on an intriguing first day at Pebble Beach. Despite kind conditions, only nine golfers managed to shoot rounds under par, with Casey bidding to be the first European to win the U.S. Open in 40 years. The pre-tournament talk had been about the strength of the British contingent of golfers, with five currently sitting in the world's top ten. And they didn't disappoint with Luke Donald, Graeme McDowell and Ian Poulter all within striking distance after the first round. But there were contrasting fortunes for the pre-tournament favorites. 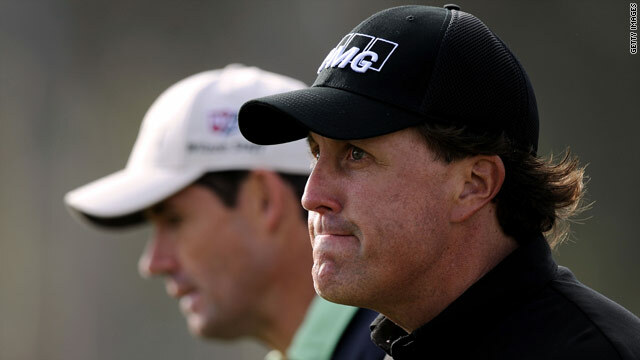 Phil Mickelson struggled to an opening round four-over par 75. Mickelson paid the price for wayward play from tee to green on the tough seaside links after opening steadily with six straight pars having started on the 10th. But the world number two was stopped in his tracks by a hat-trick of bogeys on the 16th, 17th and 18th. On the 17th Mickelson found the beach and was forced to take a drop on the way to a bogey. At the par-five 18th, the American left-hander's tee shot left him blocked by two trees. He tried to play between them, but the shot veered left and found the rocks, careening into the Pacific Ocean. A chip and two putts left him with a further bogey. Another dropped shot on the par-four fourth saw him further off the pace, but not entirely out of the hunt on a day when few players were under par. Playing partners three-time major winner Padraig Harrington of Ireland and reigning PGA champion Yang Yong-eun also struggled, but both hit back with a pair of late birdies for two-over par 73s. World number one Tiger Woods continued his poor run of recent form. After a steady start he made three bogeys to also finish on 73.